“A luminous, Marquez-esque tale” (O, The Oprah Magazine) from the New York Times bestselling author of The Museum of Extraordinary Things: a forbidden love story set on a tropical island about the extraordinary woman who gave birth to painter Camille Pissarro—the Father of Impressionism. Growing up on idyllic St. Thomas in the early 1800s, Rachel dreams of life in faraway Paris. 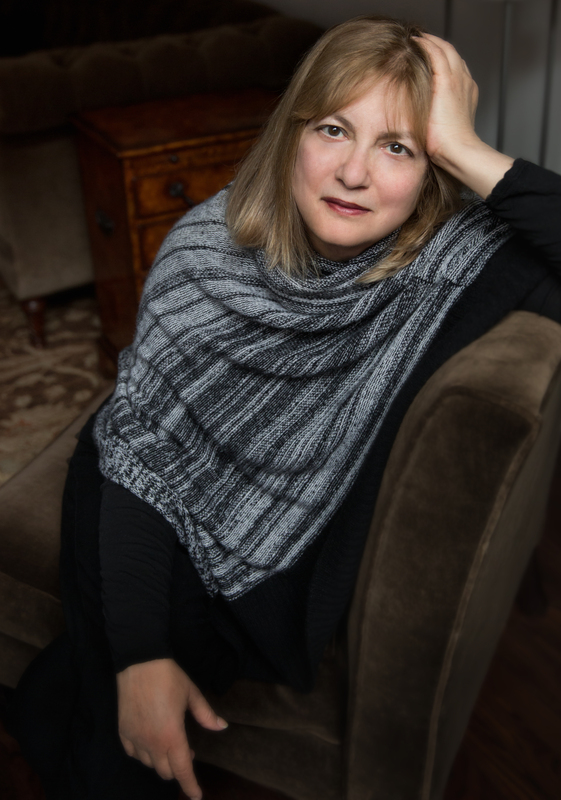 Rachel’s mother, a pillar of their small refugee community of Jews who escaped the Inquisition, has never forgiven her daughter for being a difficult girl who refuses to live by the rules. Growing up, Rachel’s salvation is their maid Adelle’s belief in her strengths, and her deep, life-long friendship with Jestine, Adelle’s daughter. But Rachel’s life is not her own. She is married off to a widower with three children to save her father’s business. When her older husband dies suddenly and his handsome, much younger nephew, Frédérick, arrives from France to settle the estate, Rachel seizes her own life story, beginning a defiant, passionate love affair that sparks a scandal that affects all of her family, including her favorite son, who will become one of the greatest artists of France. 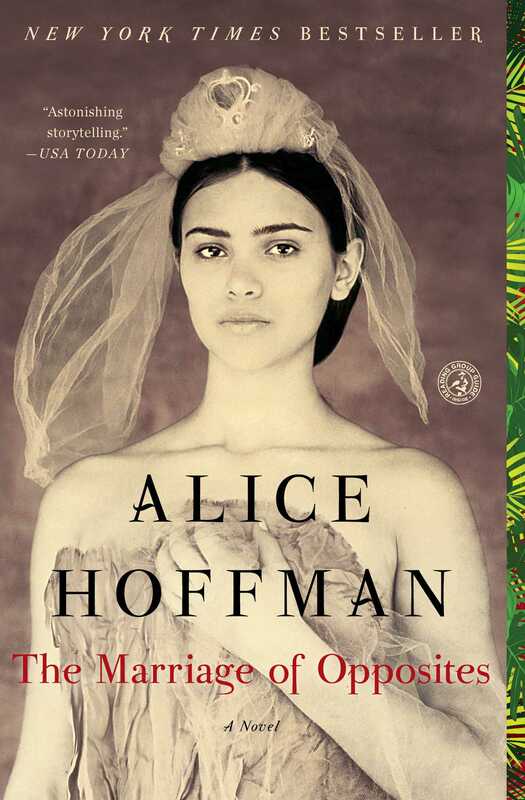 “A work of art” (Dallas Morning News), The Marriage of Opposites showcases the beloved, bestselling Alice Hoffman at the height of her considerable powers. “Her lush, seductive prose, and heart-pounding subject…make this latest skinny-dip in enchanted realism…the Platonic ideal of the beach read” (Slate.com). Once forgotten to history, the marriage of Rachel and Frédérick “will only renew your commitment to Hoffman’s astonishing storytelling” (USA TODAY). I always left my window open at night, despite the warnings I’d been given. I rarely did as I was told. According to my mother, this had been my response to life ever since my birth, for it took three days for me to arrive in the world. As a child I did not sleep through the night, and I certainly didn’t follow any rules. But I was a girl who knew what I wanted. Other people shivered when the rains came and were chilled to the bone, but I longed for cold weather. Nights on our island were pitch dark, the air fragrant and heavy, perfect for dreaming. As soon as the light began to fade it was possible to hear the swift footsteps of lizards rattling through the leaves and the hum of the gnats as they came through the windows. Inside our stucco houses, we slept within tents made of thick white netting, meant to keep mosquitoes away. In rain barrels of drinking water we kept small fish that would eat the eggs these pests laid atop the water’s surface so there would be fewer of them to plague us. All the same, huge clouds of insects drifted through the heat, especially at dusk, bringing a fever that could burn a man alive. Scores of bats descended upon our garden, flitting through the still air to drink the nectar of our flowers, until even they disappeared, settling into the branches of the trees. When they were gone there was only the quiet and the heat and the night. Heat was at the core of our lives, a shape-shifter that never was too far from the door. It made me want to step out of my clothes and dive into another life, one where there were linden trees and green lawns, where women wore black silk dresses and crinolines that rustled when they walked, a country where the moon rose like a silver disc into a cold, clear sky. I knew where such a place could be found. Once, it had been the country of my grandparents. They had come to the New World from France, carrying with them an apple tree to remind them of the orchards they’d once owned. Our very name, Pomié, came from the fruit that they tended. My father told me that our ancestors had searched for freedom, first in Spain, then in Portugal, then in Bordeaux, the only region in France that accepted people of our faith at that time. Yet freedom was fleeting in France; our people were jailed, then murdered and burned. Those who escaped journeyed across the ocean to Mexico and Brazil, many aided by the Marrano Fernão de Loronha, who financed expeditions and hid his faith from those in power. Even Columbus, who called our island Heaven-on-earth upon spying it, was said to be one of us, searching for new land and liberty. In 1492 Queen Isabella expelled our people from Spain on the Ninth of Av, the worst day in the history of our people. It was on this date when the first Temple in Jerusalem was destroyed by Babylonia and the second Temple was destroyed by Rome. It was on this very day, in the year 1290, that all Jews had been expelled from England. Thousands of our children were baptized and shipped to the island of São Tomé off the coast of Africa, then sold as slaves. In the year 1506 four thousand were massacred in Portugal during Passover. Many converted, continuing to practice their religion underground. I pitied those who had stayed behind, forced to take on Christianity. My father had told me that in time even that sacrifice wasn’t good enough; such persons were called Conversos, and were looked down upon and degraded, their property and rights taken from them. Those who survived were the ones who knew when to flee. The Inquisition followed our people across the ocean, where they were once again murdered and cast out in Mexico and Brazil. My grandfather was among those who found themselves on the island of Saint-Domingue, and it was there both my parents were raised. But there was no peace in societies where sugarcane was king and people were enslaved. In 1754 the King of Denmark had passed an edict proclaiming that all men could practice their religions freely on St. Thomas; he outlawed new slavery and gave Jews the civil rights of other men, even granting them admission to associations such as the brotherhood of Masons, which allowed our people to do business with non-Jews. My parents came, then, to the island of the turtles, for more free people could be found here than anywhere in the new world, and people of our faith were soon accepted as Danish citizens, in 1814. Nearly everyone spoke English or French, but all were grateful for the Danish rule. In 1789 there were fewer than ten Jewish households listed in the tax registers, but in 1795, the year I was born, there were seventy-five people, with more settling on our shores each year. Once he arrived my father swore that he would never again travel. He brought along the apple tree, and my mother, and the one man who was loyal to him. OUR ISLAND WAS A small speck of land, little more than thirty square miles set in the blue-green sea. The original population had all vanished, destroyed by disease and murder. The native people, called the Caribs, believed their ancestors journeyed to this island from the moon; having seen the dull earth, they’d come to give it light, traveling through the clouds, drenching our island with color, so that shades of orange and blue and red were scattered everywhere. But the Caribs’ ancestors were trapped here by storms and had no choice but to stay in a place where they never belonged. They wound their long, black hair into plaits of mourning both for themselves and for our world. They were right to mourn, for until the Danes brought freedom here, the island’s history was one of injustice and sorrow, a society built by convicts and slaves. AS IT TURNED OUT, the fruit of our name did not grow well in tropical weather. It was far better suited for cooler climates. My grandparents’ apple tree, planted in a large ceramic pot in the courtyard, never grew any bigger. When I watered it during the dry season, it was so thirsty, it could never drink enough. Its brown leaves crinkled and sounded like fluttering moths as they fell to the ground. The fruit it bore was hard, the skin more green than red. Still this was our heritage, the fruit of France. I ate every apple I could find, no matter how bitter, until my mother found me out and slapped my face. My mother’s full name was Madame Sara Monsanto Pomié, and she was a force few people would dare to go up against. Her anger was a quiet, terrifying thing. “These apples were meant for your father,” she told me when she found me gathering fruit that had fallen onto the patio. I walked away from my mother and from the tree without a word. Unlike other people, I had no fear of her. I knew she wasn’t as strong as she seemed for I’d heard her weeping late into the night. I told myself I would be in Paris when I next ate the fruit of our name. Though I’d been born here, I’d always believed it was not my true home. I was trapped on this island much like the people who had come across the sky and could do nothing more than stare at the moon through the vast distance. But unlike them, I would reach my destination. From the time I could read, I found solace in my father’s library, where he collected maps of Paris, some made by the great cartographer Nicolas de Fer. I traced my hand along la rivière de Seine and memorized the parks and the tiny twisted streets and the paths of the Tuileries Garden, created by Catherine de’ Medici in 1564, covered with ice in the winter, a cold fairyland. It was my father who first told me about Paris, as his father had told him, and to us, it was the place where everything beautiful began and ended. Although my father had never been there, I came to believe I would someday see that city for him. At the ages of ten and eleven and twelve I would have preferred to remain in the library but was often forced to accompany my mother when she visited her friends who were members of Blessings and Peace and Loving Deeds, the association of women who did good deeds among people of our faith. I discovered that even these pious women of the Sisterhood liked to keep up with the chic styles, and several of them had come to our island directly from France. I asked the maids in these households where I might find the Journals des dames et des modes and La Belle Assemblée, the best fashion journals. Disappearing into dark dressing rooms where I didn’t belong, I lay on the cool tile floor and sifted through page after thrilling page. There were cloaks with fox collars, boots in maroon leather, kidskin gloves that reached the elbow and closed with two perfectly placed pearl buttons. Occasionally, I tore out a page to keep for myself. If anyone noticed, they didn’t reprimand me, for in those dressing rooms I also stumbled upon secrets best left untouched. Love notes, bottles of rum, piles of hidden coins. It seemed that some of the most prominent women in our community strayed, for Jewish women were bound by rules on every side: the rules of God, but also the rules of the Danes, and of our own leaders. We were meant to be mice, to go unnoticed so that we would not bring hatred upon our people, who had been so ill-treated in every nation. But I was not a mouse. In the fields where I walked, I was much more interested in the actions of the hawks. NEARLY ALL OF MY father’s books were printed in French, many bound in leather with gold letters embellishing the spines. Every time a ship came from France my father was waiting on the dock, there to collect a parcel so he might add another volume to his library. I disappeared into that cool, shuttered room whenever I could. Girls did not attend school, but here in the library I found my education. My father taught me to read English, and Spanish and Hebrew, along with bits of Danish and Dutch, and of course we spoke French. He educated both me and my dearest friend, Jestine, although when we read aloud he laughed at our Creole accents and he did his best to teach us the more proper pronunciations. When my mother complained that I would learn more in the kitchen, and flatly stated that Jestine shouldn’t be in our house at all, my father was furious. Jestine and I slipped under his desk, our hands over our ears so we couldn’t hear the bitter words between my parents. I knew my mother thought I would be better served spending time with girls of my own faith, rather than befriending someone whose mother was an African and our cook. But of course, little of what my mother wanted meant anything to me. JESTINE WAS AFRAID OF my mother, and shy around my father, and she never came back to the library. Instead, I brought books to her house and we read on the porch, where you could see between the slats straight into the ocean. Sometimes we read aloud in dreamy voices, with accents as elegant as we could manage, but mostly, I spent my hours alone in the library. I read while my mother was out with the society of good deeds, visiting women who had no husbands and children who were orphans, the sick and infirm and needy. I knew I was safe in the library, for my mother believed it to be the domain of my father, and after their argument about girls learning to read she never again came uninvited into that room. As a reader, I first became engrossed in Histoires ou contes du temps passé, avec des moralités: Les Contes de ma mère l’Oye, what the English called Mother Goose. In every marvelous tale collected by Charles Perrault, there was the sting of truth. As I turned the pages, I felt as if there were bees on my fingertips, for I had never felt so alive as when reading. Monsieur Perrault’s stories explained my own world to me. I might not understand all that I felt, but I knew a single one of his chapters was more enlightening than a hundred conversations with my mother. Il était une fois une veuve qui avait deux filles: l’aînée lui ressemblait si fort d’humeur et de visage, que, qui la voyait, voyait la mère. Elles étaient toutes deux si désagréables et si orgueilleuses qu’on ne pouvait vivre avec elles. Once upon a time there was a widow who had two daughters. The elder was so much like her, both in looks and in character, that whoever saw the daughter saw the mother. They were both so disagreeable and so proud that there was no living with them. Perhaps that was what my mother disliked most. I resembled her. I could not help but wonder if for some women, that was the worst sin of all. I no longer cared if my mother disliked me. I didn’t understand that when I closed myself to her, I took a part of her bitterness inside me. It was green and unforgiving, and as it grew it made me more like her. It gave me my strength, but it gave me my weakness as well. My mother tossed me a knowing look on the day I spoke back to her. “I hope you have a child that causes you the misery you have caused me,” she told me with all the power of a curse. From then on she acted as if I were invisible, unless she had a task for me or a complaint about my appearance or my deeds. Perhaps she was so cold to me because she’d lost the child that had come only nine months after my birth. He had been a boy. She had wanted to give my father a son; perhaps she thought he would love her more if she had been able to do so. I often wondered if she wished that of her two children, I’d been the one who had been taken. Once upon a time there was a king and queen, who were so sorry that they had no children—so sorry that it cannot be told. My father had recovered from the loss and loved me, but my mother was inconsolable, refusing to open her door, to him or to me. By the time she was improved enough to oversee the household once more, my father no longer came home for supper. He was out until all hours. That was when I began to hear my mother weeping late into the night. There was a part of me that knew my father had left us in some deep way I didn’t quite understand. I only had access to him when we were together in the library, and I loved them both—the library and my father—equally and without question. JUST AS PERRAULT HAD interviewed the women in the salons about the stories their grandmothers had told them, I spoke to the old ladies in the market and began to write down the small miracles common only in our country. For as long as I was trapped here, I would write down these stories, along with a list of the wondrous things I myself had seen. When I went to France, I would have dozens of tales to tell, each one so fantastic people would have difficulty believing it. In our world there had been pirates with more than a dozen wives, parrots who could speak four languages, shells which opened to reveal pearls, birds as tall as men who danced for each other in the marshes, turtles that came to lay their eggs on the beach in a single mysterious night. On these occasions I would wait in the twilight with Jestine, watching as the shoreline filled with these lumbering creatures, all so intent on their mission on the worn path they always took that they didn’t notice us among them. We were turtle-girls. If we had been inside of a story we would surely have grown shells and claws. In silence, we studied the beach through the falling dark. We could not light lanterns, for turtles follow the moon, and in the eyes of such creatures the moon is any globe of light, even one you hold in your hand. I had pinched a blue notebook with fine paper made in Paris from my father’s store. If anyone noticed they didn’t say so, although my father’s clerk, Mr. Enrique, a stern, handsome man, looked at me differently after that. The first story I wrote down was one the old ladies told about a woman who’d given birth to a turtle. They liked to take turns when they told it, so that each storyteller added a detail or two. The woman who was the turtle-girl’s mother was so stunned by the green shell surrounding her baby that she ran down to the beach and left the newborn by the shore. She meant to desert the child and let it be taken out to sea with the tide, but luckily, a mother turtle with a nest of hatchlings was nearby and she raised the turtle-girl as her own. Jestine and I always searched for a turtle that was half human, with a human face and soul. She was said to have grown to be a woman who looked like any other, with long arms and legs and moss-tinted hair. You couldn’t see her shell unless she was in the sea. She could have easily disguised herself and joined our world, eating in cafés, dancing with men who found her beautiful, but instead she’d chosen to live in the world of the turtles. If you happened upon her you would see that her skin was a pale green and her eyes were yellow. She had swum to every gleaming sea in the world, but always came back to our shore. We are here, Jestine and I whispered as we stood on the beach. O Sister, we called. We would not forsake her or judge her if only she would show herself to us. But she never did, no matter how late we stayed, even when we waited until the last of the turtles had returned to the bay. It was clear that Jestine and I were as uncomfortable as the mysterious turtle-woman when in the company of humans. Jestine was especially shy, perhaps because she was so beautiful her mother had warned her not to be too friendly to the boys and men who might approach her. As for me, I was distrustful by nature. The two of us roamed the island as if there was no one else in the world. We would collect buckets of hermit crabs and ghost crabs and race them against one another in the sand before setting them free and watching them scramble away from us as if we were monsters. Sometimes I was forced to bring along my younger cousin Aaron Rodrigues, who lived with us. There were three years between us and he was nothing but an annoyance to me. I was told his parents had been lost in a storm when he was little more than a baby and afterward our family had taken him in. My mother preferred him, even though he wasn’t related to us by blood, perhaps because of the baby boy she lost. Girls were not worth very much in her eyes, especially a disobedient girl such as myself. Aaron was handsome, dark, with startlingly pale blue eyes. Even as he grew older, my mother still enjoyed showing him off to her friends, especially the formidable Madame Halevy, whose stern presence intimidated us all but who melted whenever she saw Aaron. Mon chouchou, she called him, even when he was a rowdy boy of nine. Mon petit canard. In return I pinched Aaron and called him a duck in English, not such a pretty word. He always gave me a wounded look, though he didn’t complain. I should have been guilt-ridden, but I suppose I was a brutal girl. I knew what happened in fairy tales. The strong survived while the weak were eaten alive. On nights when I was forced to look after Aaron, I gave him over to Jestine, who was more kindhearted than I. Perhaps because he was an orphan and Jestine had no father, she could feel compassion for him, even though he was a wild boy, who delighted in leaping from cliffs. I took to scaring him to get him to behave. He was terrified of werewolves, half-human beasts that were said to reside on the old plantations. My father had assured me these were made-up stories, used by the plantation owners to frighten slaves from running away. There is the outside of a story, and there is the inside of a story, he told me as we sat in his library one afternoon. One is the fruit and may be delicious, but the other is the seed. By now my father had decided I’d had enough of fairy tales and was too old for such notions. Perhaps my mother had complained to him or perhaps he thought I should be more serious or maybe he simply longed for the son he’d lost and wished to educate me in the way he would have had I been a boy. Monsieur Pomié was a respected member of the Burghers’ Association, the businessmen’s society that one must join to be a merchant, in my father’s case, a shop owner who exported rum and sugar and molasses. Aaron was fated to take over his business, since girls and women could not inherit property, but perhaps my father hoped those laws would change. He began to teach me figures, so I would understand the ledgers in the store, and I was honored to be educated in a way few girls were. All the same, I wrote down the werewolf tale the way I’d heard it from our cook, Adelle. She had told us that the werewolves were members of the old Danish families who owned slaves. Their transformation was God’s punishment for their wrongdoings. You could spy their teeth and claws at night, even when they were in their human guise, so they often wore gloves and scarves, even in the hottest times of the year. If you see such a thing, Adelle told us, run. I read this story to Aaron on a nightly basis. Though it terrified him, he always wanted to hear it again and again. It came as no surprise that he began to imagine such beasts in every dark lane and alleyway. He stayed close to Jestine, trusting her as much as he mistrusted me. Sometimes I made a howling noise when I walked behind him and he’d jump as if he’d been bitten. “Must you frighten him?” Jestine would ask me. “Must you pity him?” I would say. Still, I admit that on certain nights I had my own fears, not of roaming half wolves, but of our own homeland. It seemed there was an inescapable loneliness here. The bats above us, the wind from Africa, the roar of the waves. It was as if we were on the edge of the known world and could drop off into the darkness at any time. When the three of us were out together, no one knew where we were. If anything happened, we would have to save each other. PEOPLE WHO CAME HERE from Europe often claimed they couldn’t tell the difference between winter and summer on an island as mild as ours. They clearly didn’t know this island. We had times of rain and wind, blue nights when a cold thread coiled through all the houses, pinching the babies and making them cry. On such nights the fish in the ponds turned black and floated to the surface. The leaves of the jasmine curled up like little frogs. But in summer, everything turned white-hot and bright in an instant, with sparks in the air that were as hot as flames. The heat stunned people who weren’t used to it. Women who accompanied their husbands here from France on business often fainted moments after disembarking from their ships. They were given a drink made of palm bark and sugar water, yet many could never abide the bright light, not if they stayed here for years, not if they spent their whole lives here. They shrank into darkened rooms, keeping their window shades closed against the fierce light, not venturing out until dusk. We would see them sometimes, crying in courtyards. “Werewolves,” my cousin Aaron would declare when we passed by these houses, for their weeping sounded like howling. “No, they’re not beasts,” Jestine assured him. “Just lonely women from France, longing for home.” But whenever we came near the old Danish estates, where there were still slaves living in shacks, we ran as fast as we could, with Aaron trailing behind us, until he grew so tall he could outrun us. Then we had to use all our strength just to keep up with him. By the age of twelve he was six feet tall, so handsome that grown women stopped on the street to call to him. Jestine made certain he didn’t go to investigate when the women made clucking noises aimed at him, as if they were hens and he was a fox. I knew then, she wanted him for herself. EACH YEAR I HAD more stories to write down. The women at the market waited for me whenever they had a new one to tell. There was the story in which a hundred butterflies arose from a single tree all at once to form a second yellow moon, and one about a fish with the face of a horse who came galloping into the city one night, and another about a bird that flew halfway around the world for love, and was flying above us still. I tied my notebook with ribbon and kept it beneath my pillow, far from the grasp of my mother. “Don’t tell,” I warned the laundry women who came to change the sheets. They understood why I would keep a secret from my mother. She had little tolerance for what she considered to be nonsense, and that included most things in this world, even the history of our people, and how we had come to be so far away from our rightful home. I knew if she found my notebook she would toss it onto the trash heap at the back of the yard. Everything I knew of our island I had learned in my father’s library. It was a complicated history, for St. Thomas had traded hands many times, belonging to the Spanish, the Dutch, the English, and finally, the Danes, who sent the Danish West India Company to begin a society that was mostly concerned with trade. In 1688, of the 739 people who lived here, 317 were Europeans from eleven nations and 422 were African people, who were brought here against their will. The wretched slavers’ ships docked across from schooners belonging to the relations of royalty, many of whom had been cast out from their own kingdoms and had no inheritance other than tracts of land in the mountains beside the dormant volcano known as the Quill. Pirates from all nations camped in the coves, hidden from the authorities. Captain Kidd had roamed the shore, along with a fierce and pitiless man known as Blackbeard, who attacked ships in the harbor, kidnapping wealthy residents, taking dozens of local women as wives, and forcing women en route to America to wed him as well. He was voracious, hungry for more despite all he had. There were people who claimed he’d had twenty wives; others insisted it was more than thirty. Some he kept, some he passed on to marry his sailors. The grass grew tall in the fields, and wild donkeys roamed freely, left behind by the pirate wives who had begun farms in an attempt to civilize their husbands. Trees from Madagascar had been brought here on their lawless ships, and after the pirate wives had been abandoned by their men, they’d sown the seeds from their homeland as if they were blood-red tears. Even now as the graves of these women went untended, and their passings unmourned, the seeds they had scattered turned the hillsides red and orange from May to September. Some called the pirates’ bounty flame trees, but to us they were known as flamboyant trees, for no one could ignore their glorious blooms, with flowers that were larger than a man’s open hand. Every time I saw them I thought of these lost women. That was what happened if you waited for love. ON NIGHTS WHEN I couldn’t sleep, I took a candle and sneaked into my father’s library so that I might look at his maps of Paris. I was especially entranced by the garden of the Tuileries, for my father had recently told me the King had wanted the park for himself until Monsieur Perrault roused the crowd, insisting that each common person had a right to Paris and to that garden. From my father’s books about ornithology and botanicals, I turned to François-Nicolas Martinet’s illustrations for Histoire naturelle des oiseaux to learn about kingfishers and swans and nightingales. My father loved books of landscapes and architecture with huge hand-colored plates illustrating the gardens, and he particularly valued roses, which were not natural to our shores. White Alba roses, tea-scented roses in shades of apricot and yellow, China roses with blooms as big as plates, and Bourbon roses, which had been developed in a prince’s greenhouse. In these books I discovered winter fruits most people on our island had never seen, apples and pears and blackberries and then, in the spring, raspberries and strawberries the color of gems. I stood before the bookcases in my bare feet while outside the wind from Africa came across the sea. I was somewhere else completely, inside a story where I shivered in the snow and drew my fox cloak around me. I stepped over the ice in my fine leather boots. Once there had been a girl who slept for over a hundred years. There was a daughter who protected herself by wearing the skin of a donkey. A cat that was wiser than the men around him and earned such a huge treasure it never had to chase mice again. I kept the book of fairy tales close to my heart, the cover flaming blue. That would keep me warm, until at last I reached the place where I belonged. AT FIRST THERE WERE six families of our faith here who said prayers around a dining room table and formed a burial society in 1750 so they might begin a cemetery in an area that was then a wasteland called the Savan. The year after I was born the synagogue was founded, with the right to do so granted by the Danish King, Christian VII. It was called Kahal Kadosh Beracha VeShalom, the Holy Congregation Blessing and Peace, and our burial society was named Deeds of Lovingkindness, named for those who cared for the dead. There was a doctor employed by the congregation, and the poor were cared for. The council safeguarded our civil rights as best they could in a world where people of our faith must always be cautious, ready to swim away when need be. In return for all the synagogue did for us, decency and decorum must be observed and unity preserved at all costs. Fines were levied upon anyone who disagreed with the Reverend. Troublesome congregants would be dealt with by the committee chosen to do so. The Danish government tolerated our congregation, but any incident or infighting could bring attention to us now, and the government’s acceptance of us could always change, with people executed and jailed, vanishing as if they had been enchanted and turned into stalks of grass. By the time I was a young woman there were eighty families in our congregation. At Friday night services my mother and I sat behind a sheet of white muslin that separated the women and children from the men. My mother always sat beside Madame Halevy. Together they were a powerful force. The Sisterhood of Blessings and Peace and Loving Deeds monitored themselves and us; they were judge and jury in all social matters and on occasion were far harsher than the Danes might have been. It was their world, after all. THE SYNAGOGUE WAS A small wooden building, lit by candles that flickered in heavy silver candlesticks brought from Spain a century ago. Someday our prayers would be recited in an elegant building made of stone, but even then, we would keep the floor as it was, made of sand, as it had been in Europe for the duration of the terrible years when we had to hide who we were, when footsteps on marble or stone might give away our place of worship to those who wished to cause us harm. The inside story of our people’s lives had been kept secret for hundreds of years, a stone inside a fruit, the truth of who we were. To outsiders, people of our faith were considered mysterious beings. There were Christians who whispered that we were like shadows, able to slip through a net like fish. If we were shadows, then our history had made us so. We went through life underwater, unseen by those in power who might turn on us. My people accounted for nearly half the European population of the island. We were called Creoles, Europeans who had never been in Europe, Jews who hadn’t stopped running from persecution until we came here. Yet we still cooked our food in the French way; we added olives and chives and caperberries, in the old Spanish style. We carried our pasts with us. Perhaps that was what made us appear to be shadows, the burden we carried with us, the other lives we might have led. My father had told me that no matter how comfortable we might feel, we must live like fish, unattached to any land. Wherever there was water, we would survive. Some fish could stay in the mud for months, even years, and when at last there was a high flooding tide, they would swim away, a dark flash, remembered only by their own kind. So perhaps the stories they told of our people were true: no net could hold us. I KNEW I MUST do all as I was told, yet something burned inside me, a seed of defiance that must have derived from a long-ago ancestor. Perhaps my mind was inflamed from the books I had read and the worlds I had imagined. I gazed at myself in the silvered mirror in our parlor and I knew I would do as I pleased, no matter the consequences. I rarely helped to make the Sabbath meal, as such duties did not suit my nature. I was not a cook but a huntress. Because of this, I was often sent to find a chicken in the yard behind the kitchen house, a small building made of white stucco, separate from the main house to ensure that the heat of our cookery wouldn’t enter the rooms where we lived. I wore a black apron so that any blood I spilled wouldn’t show. With the heat of the day rich and hot on my skin, I looked forward to Friday afternoons, when I became a killer of chickens. I listened to the thrum of the bird’s heart and the beat of mine quicken together. I always said a prayer and called upon God’s grace, and then I was not afraid. I was practical, and I thought it important to teach myself to face whatever other girls feared most. I stared at the clucking birds until they quieted, for they were easily calmed. Then I chose one, wrapped it in a cloth, and took its life before bringing it into the kitchen so that Adelle could pluck its feathers. In return I was given a plate of ripe sapodilla fruits, which tasted like caramel. These small egg-shaped fruits were my favorite treats; as I ate I imagined they were sweets from a shop in Paris rather than hard-shelled fruits fallen from a tree. I couldn’t remember a time when Adelle didn’t work for us and I did not spend my days with her daughter. Jestine had her mother’s brown skin but gray, nearly silver eyes, as if she were related to those incandescent first people who had come here to bring light from the moon. She and I did everything together. We often helped Adelle, who was the best cook on the island. Other than the library, the outdoor kitchen where Adelle worked was my favorite place. Our dinners contained my family’s recipes for stews and soups from the old world, but Adelle added lime juice, papaya, banana, rosemary, all ingredients from our garden. When my mother was not at home Adelle often made us a supper of rice and beans and fried conch meat that we first had to pound tender with a hammer. At lunch we had the local cornmeal porridge called fongee, which my family thought of as food for the poor. Best were the snacks Adelle made, a most delicious mixture of mango, tamarind, gooseberries, and sugar. Jestine and I ate this with our fingers, in heaven to have something my mother would never have allowed to be served at our table, eating in a way that would have made her call us pigs. Jestine accepted her mother’s advice, but I was too curious to be satisfied. I peered into the faces of men in our congregation, looking for features that resembled Jestine’s. I was certain that she belonged to my people, and was therefore my sister, as I was hers. The cottage where Jestine and Adelle lived was set on stilts; even if the floodwater was high enough to surround it, the house and its contents and those who lived inside would be safe. You had to jump puddles on the path if you wanted to pay a visit, and sometimes there were starfish in those puddles, stranded until the next high tide. The wide porch was constructed from wooden slats, and it was possible to look right through into the blue sea. Some of Adelle’s furniture was fashioned of local mahogany, upholstered with leather and mohair seats; other pieces, a carved bureau for instance, had been imported from France. There was a lace runner on the tabletop, and kerosene lamps lit the sitting room; at night her whole house was like a lantern, a beacon on the shore. As far as I knew, no one thought worse of Jestine because she had only a mother. Many people didn’t have fathers, or at least not ones they knew. Those of mixed blood who had white fathers were given their freedom, even when a man was not cited by name, and people of mixed race accounted for more than half the population of color. Still, I was glad that I did have a father and proud that he was Moses Monsanto Pomié, a man well thought of by his neighbors, a businessman favored in all his endeavors. I was happy that I didn’t have to look into men’s faces, searching for a part of me, some feature that connected us by bond and blood. Jestine never looked, no matter how I urged her to do so. She shrugged and said a mother was enough and she didn’t need more. She was cautious when I was curious, kind when I was arrogant. She was far too gentle to kill a chicken, so whenever Adelle sent her to do this, I always took her place. We laughed and spoke of exchanging lives. I would have liked to live in a house where I could hear the sea in my dreams. Jestine wanted to be within the garden walls where the light had a gold tint in the evenings and bees gathered in the blooms. We would dress in each other’s clothes, say good night to each other’s mothers, dream each other’s dreams. But such a thing could never happen. And for this I blamed my mother. No one would trade for Sara Pomié. “You would beg for your life back before morning,” I said sadly. Jestine knew how stern my mother was, how sharp her tongue was, how bitterly she complained. When we heard Madame Pomié’s voice we always had a jolt of fear, unwilling to face her unflattering comments. In Madame’s eyes, nothing we did was right. There were days when I wished I were a boy, for if I had been I might have set off to France as soon as I turned seventeen, sailing on one of the schooners that left from the docks near Adelle’s house. We had cousins who lived near Paris, and the businesses on both sides of the Atlantic helped each other: the French Pomiés shipped us fabric of all varieties, along with glassware and china, while we sent back molasses and rum and sugarcane. I ambled along the harbor, passing Fish Wharf and Cow Wharf, skipping over puddles. With every step I wished myself away to another life, one lived far from here. Adelle said that I had been on earth before. My mother didn’t like this sort of talk; people of our faith didn’t believe in past lives or spirits. But Adelle whispered that it was an honor to be able to reach over to the other side, the place where the lost and the found comingle. We had experimented with my powers. We went into the woods one night, just the two of us. Jestine was too afraid and went to bed early. I took pride in Adelle’s estimation of me, and I tried to live up to her high opinion, even though the night was so dark and we were so deep in the hills, up near the caves where the pirates had lived. “I want to call the pirates’ wives,” I said. When I held out my hands in the pitch dark they filled with orbs of light. That meant the souls of the dead were around me. They came like moths drawn to a lantern. I felt the sting of their spirits. They whispered things I was too innocent to know about, what they had done for love, and for hate, what had happened to them at night in the arms of the men they belonged to, those they mourned and those they had wished dead. I felt their sorrows and my heart quickened. I wished I were the person Adelle thought I was, but I was afraid of my own power. I suppose I was too young, and raw emotion frightened me. The idea that a woman might be willing to ruin her life for love was far beyond my understanding. I shook my hands to disperse the spirits into the air. I was afraid I had gone against my religion on this night, but Adelle told me that women of every faith have power. They just have to find it within themselves. I painted my room a shade called haint blue. Blue kept unwanted spirits away; ghosts and demons could not cross over water, nor could they enter a room that was the color of the sea. I did not tell my mother the reason I had chosen this vivid blue, knowing she would have disapproved. She said superstition was for fools. The truth was, I sometimes regretted painting my chamber, for I often wished a spirit might travel to me from across the water and take me with him past the hedges of jasmine, over the garden wall, back to Paris. I peered out through the vines of oleander and bougainvillea, silver and purple in the dark. I could hear moths fluttering, many as big as birds, as they struck against the shutters of my room, called to the yellow light of the candle on my table. They could not get in. Whether they were spirits, I did not know. I wondered if all creatures were drawn to what was dangerous or if we merely wanted light at any cost and were willing to burn for our desires. When I looked at myself in the gilt-framed mirror in the hallway, studying my black hair and dark eyes, seeing the glint of gold, I wondered if indeed I might be the sparrow who became a swan. The women from Blessings and Peace and Loving Deeds complimented my mother when they came for tea, and for good reason. My mother had a lovely house, one of the tall stucco mansions in town, painted pink, with patios and gardens hidden behind high walls. Much of the furniture had been ordered from France by my father, who delighted in beautiful things. Madame Pomié always presented exceptional food, the latest recipes from Paris—cooked birds in pastry, a soup made of sorrel. Adelle knew not to speak when she served the ladies ginger tea for good digestion, along with butter cookies and slices of mangoes. Most often Madame Halevy led the discussions concerning anyone whose children were ill-behaved or whose husbands had an eye for other women. Such transgressions were common knowledge, and there was little tolerance for weakness or wrongdoing. THE WOMEN FROM THE congregation might appear delicate and ladylike, but on this island strength was a necessity. Most of these women could climb onto a roof before a storm to make certain that the shutters at every window were bolted shut, they could cook over an outdoor fire, kill chickens and wild waterfowl, do what they must should the tolerance of our people fade in yet another country. It was said that Madame Halevy gave birth to her first child alone while her husband was off to sea and was rumored to have cut the cord of life with a carving knife. She had lost two sons to yellow fever, but her daughter in America was said to be a great success and a great beauty. My mother was not as lucky. By the time I was of marriageable age everyone knew I was moody and disagreeable. I thought too highly of myself and was too choosy. I was already considered an old maid. Though I had masses of glossy hair that shone after I washed it with prickly pear juice, and almond-shaped eyes, I possessed a sharp face and a sharper tongue. I had barely glanced at any of the boys who might have been interested in me, all of whom had gone on to marry other people’s daughters. My father had tried to arrange a marriage for me several times with little success. People said I was difficult and would bring only trouble to my husband. Truly, I was happier on my own. I enjoyed the privacy of my room, which overlooked the courtyard, especially in the season when the frangipani flowered and the garden turned pink. I had observed the lives of other young women, and marriage seemed a difficult and hazardous path. Many children were lost, often in infancy, to malaria and yellow fever and smallpox, and young mothers died giving birth or soon after. Even with the help of maids, marriage was hard labor, not a fate I looked forward to. I chanted the prayers of my own faith, but I remained interested in the spirit world. I knew from my readings in my father’s library that our people had once believed in seers and signs. When I was alone, I studied the Book of Ezekiel and the Song of Solomon, mystical chapters filled with wonders. I knew I would be reprimanded if I were discovered reading these texts, which sang the praises of both spirit and flesh. From these readings, however, I knew our people were drawn to mysteries before we were forced to hide who we were and be most concerned with survival. Still such things were a part of us, and we remained in awe of God’s miracles. When a storm came up my father asked the archangel Gabriel to protect us from woe. I often went outside and thought I saw this angel in the sky above us. He was made of golden light and of the breath of the earth. Sometimes he heard my father’s prayers, and sometimes he turned away from us. Adelle was known for having the gift of sight, and local women who were with child often came to ask her if they would have a son or a daughter. She held a ring on a chain over them and told them to be silent. If the ring moved in a circle, that meant a daughter; back and forth meant a son. She once predicted I would have many children. I laughed at the notion. She was usually correct, but in my case was most certainly wrong. “Maybe you’re confusing my fate with Jestine’s,” I suggested, for I didn’t like children, whereas Jestine’s manner with them was easy and assured. One night my father came to talk to me in the privacy of my room. It was summer and the sky was still light, streaked with a gold tint in the east, pink in the west. There was a vase of frangipani on the bureau. As my father drew up a chair, a hummingbird darted through the window to drink the nectar of the flowers. The tiny creature was there and gone so quickly I wondered if I had imagined him. Perhaps he was another spirit. Then I noticed a feather on the floor. I picked it up and slipped it under my pillow. Such things were said to bring luck. Perhaps my distaste for the fate of most young women was my father’s fault. He had educated me and schooled me in the ways of the business world, and because of this I understood, long before my mother ever knew, that the family business was faltering. It had been a season of storms, never good for the island. Merchandise loaded onto ships, headed for Charleston and New York, had been lost at sea. My father had large debts, ones he couldn’t repay. He was a busy man even in the best of times; he didn’t have time for idle conversation, and so I was honored that he’d come to speak to me in the quiet of the evening. I wore a white cotton nightdress, and my hair was plaited, then pinned up. My face was scrubbed clean. My father sat in a hard-backed wooden chair with a cane seat. He wore a charcoal gray suit, formal, with pearl buttons. He was a dignified, well-mannered man. Clearly the reason for this visit was serious, for this was the same suit of clothes he wore to his shipping office. “We must change our business and our lives, or we’ll become one of the families the women from the congregation of Blessings and Peace take pity on, bringing us supper on Friday nights. I do not intend to have us living in a hut in the Savan,” he told me. I leaned forward, straining to hear his every word. Until this year my father had been so successful that people came to him for advice, and he made his suggestions in a quiet, forceful voice. He had fled from an island where there was such cruelty against Africans that the enslaved people finally rose up in a riot of blood. Like his forefathers, he knew when to depart even though it meant leaving his worldly goods behind. He’d had one slave, and that had been Mr. Enrique. Mr. Enrique was the one who told my father that the time had come, the flower of the revolution was blooming, fed by rage and despair. On Saint-Domingue, all French families were advised to leave their homes, with the men to stay and band together in safe areas where they would stand ready to fight. That was not my father’s intention. Because my father was so well known and could not be seen in public without being held back to fight against the slaves, Mr. Enrique readied a boat. My mother went to the harbor with diamonds and pearls sewn into the hem of her dress, wearing a black cloak, for she was pregnant with me. Perhaps that was when I first became a burden to her. She covered her head with an embroidered shawl so she might not be noticed. There was only one way my father could have reached the shipyard. Enrique helped him to escape by hiding him in a wicker clothes hamper he carried on his shoulders as he navigated through the mobs in the street. Like the original Moses, himself a slave whose freedom was brought about when he floated through the waters of the Nile in a basket of reeds, my father was thus brought to safety. He was so grateful that he immediately turned over the keys to his house to Mr. Enrique. He knew Enrique had saved his life, and that every day forward would be a gift not only from his maker but also from this man who had risked his own life and safety for him. In turn, Mr. Enrique gave the house to his sister and accompanied my father to St. Thomas as a free man. He said that when the mobs finally heard how my parents had escaped, he would be killed for helping them, and that when people forgot he would go back home. But they never forgot and Mr. Enrique never returned. He lived in a house beyond our garden on the other side of the tall stucco wall. He had great affection for our island and the freedom he’d been granted. Outside his doorway he’d planted a St. Thomas tree, whose yellow flowers were marked with red drops, said to be caused by drops of the saint’s blood falling on such a plant when he was martyred. The deed to the cottage was in Mr. Enrique’s name, signed by my father. Once the business was set up, Mr. Enrique worked in my father’s office as a clerk. He wore a black suit every day, which only served to show off how handsome he was. There were many women who wished to marry him, but he was a solitary person. The revolution on his island had scarred not only those who had fought in it but also those who had abandoned their homeland. In the tax records Mr. Enrique was said to belong to Moses Pomié, but he’d been granted his freedom on the dock in Saint-Domingue, where they traded a life for a life. My father told us that our people had been slaves in the desert and because God had seen fit to set us free, none among us should ever own another man. It had been written that every man belonged to God and no one else. But did women belong to God or to the men of their family? They could not own property or businesses; only their husbands could have that honor. They must lower their eyes, behave, follow their appointed destinies. My father now told me I must trust in him and do as I was told. He had finally arranged a marriage, as was the custom among our people. But I had never believed he would find a match for me. As soon as I heard that he had, a chill ran through me, even though he assured me he had chosen a good man, one who would treat me kindly. I must have paled, but before I could begin to mount my argument against the marriage, my father shook his head and took my hand in his. I knew once he gave his promise there was no breaking his word. I could feel my pulse at the base of my throat. I heard the hummingbird outside the window, the whir and beat of its wings. The man my father had chosen was wise in the ways of business but had recently had some bad turns of fortune with his ships. He had several decent ships left, and so he had come to my father, who had goods to sell but no ships on which he could transport rum and molasses to Charleston and New York. Together, they would join forces, and in this way they would both prosper. It was a partnership that would include the entire family, on this island and in Europe, as both businesses were co-owned by European relatives who had lent us money. A marriage would be a bridge between the two families, our wedding vows more binding than a legal contract. “It’s a combining of strengths,” my father told me. I said nothing, but I knew it was more. It was a combining of destinies. Our congregation was so small there were only a few young men left unmarried. I assumed I would know the groom-to-be. But he was not one of the boys I had grown up with. When my father told me the name of my betrothed, I felt the way prisoners must when the cage that holds them is slammed shut and the key in the lock is turned. My husband-to-be was Isaac Petit, a man nearly thirty years my senior, the father of three children, the last a girl not yet a year old. It was the birth of this baby that had caused his wife to pass from our world. We had all gone to her funeral. I could not see Monsieur Petit from where I sat, but I had heard his children crying. The losses to the Petit family seemed beyond what humankind could bear. Several children had died: a daughter, one son and then another, two twin girls who passed from this world before they could be named, and finally a beloved son named Joseph. Only two sons had survived, David and Samuel, and then, twelve days after the last baby girl was born, Madame Esther Petit, who had been suffering from childbed fever, passed away. I had seen her many times in the market square, a slim, pretty woman who had prized the red flower of the flamboyant tree. For days after her passing people left vases of them outside her husband’s house. They were all faded now, swept away. There was a lump in my throat when I heard my fate. I thought of the map of Paris that I had memorized and my childish book of stories hidden beneath my mattress. I imagined a man I didn’t even know coming into my bed. I would rather be at the bottom of the sea, but I knew I must go forward. Perhaps someone else would have begged to be released from her father’s promise. But I had seen the ledgers, and I knew that there would be no house, no garden, no comfortable life as we knew it if the business stayed the same. This was why Adelle had seen an unexpected fate for me. I would be a mother before I ever was with a man or had given birth. My future was already waiting for me: the house of the red flowers, the motherless children who wept, the sorrowful man who had paid so little attention to his business after his wife died that he’d nearly been ruined. On the night when moths twice as large as any in Paris struck against the wooden shutters, I knew this was not a dream that would be broken by morning light. I wanted nothing more than to leave St. Thomas and be sent off to Europe, even if it meant I must care for some aging relative or clean other people’s homes. All the same, my father looked like an old man, beaten by fate. He was concerned for the future, but it was my future as well. “First I will have a discussion with Monsieur Petit,” I told my father. MONSIEUR PETIT CAME A few evenings later, after his children were asleep under the watchful eye of a maid. It was late enough for the mosquitoes that swarm at dusk to have disappeared into the damp night. The bats had settled in the trees, their shadows like leaves. I could hear them breathing as they hung upside-down in the branches. I’d asked for the meeting to be informal, outside. All the same, my father introduced us formally, though surely we’d met before, although on what occasion neither of us could remember, for Monsieur Petit had been a grown man and I nothing more than a girl. “Enchanté,” Monsieur Petit said to me. I’d been told that he’d come directly to St. Thomas from Paris, which interested me. I wished I might question him about his past there, but my father threw me a look, so I merely greeted our guest politely. The men had glasses of sherry. I had a tea of vervain, though I would have preferred rum. My mother insisted I wear one of her dresses so that I would look sophisticated, a bit older than my age. It was a gray silk frock from France, with an underskirt of crinoline that pricked at my legs, as if ants were climbing past my ankles. My hair was pulled back with combs fashioned of tortoiseshell and abalone. I knew I wasn’t beautiful, but I was young, and perhaps that was enough. My father spoke about the weather, always a topic on an island prey to storms, and then they discussed business matters, nothing too urgent. What was central to the arrangement had already been addressed before the proposal of marriage was made, in private. I asked Adelle to find out as much as she could about Monsieur Petit from the maid who cared for his children. Because of this I knew he was forty-four years of age. More than double my own age. Earlier in the day, Jestine had come into my room. She knew what was to be, and didn’t approve of arranged marriages. She gazed at the silk dress my mother had given me, then rubbed the heavy gray fabric between her fingers. “He’s proposing tonight.” I was gazing at myself in the mirror, and I didn’t like what I saw. I thought I resembled my mother. “You don’t even know him. How can you marry him?” Jestine asked. “Marriage is no different from business,” I told her. I was parroting my father, but I also believed I had a duty to him. We had always planned to journey there together, but now I shook my head. I couldn’t allow my family to be financially ruined. It was the night when the turtles came to shore, but Jestine went alone to the beach while I sat in the courtyard with the man I was to marry. Monsieur Petit nodded. “If you wouldn’t mind,” he said to my father. He still had not addressed me directly. “You’re the one who might mind. She doesn’t hold back her remarks.” My father glanced at me with an implicit warning. Once Monsieur Petit and I were left alone in the garden, the seriousness of the situation settled between us, a heavy weight. We were to marry, yet knew nothing of one another. We both gazed into the hedge of jasmine, embarrassed and ill at ease. The heat enveloped us. Jestine had been right. The gray silk dress was much too heavy for the season. I wished I could tear it off and toss it into the shrubbery, then sit across from my fiancé in my white cotton chemise and petticoat so I might be more at ease. My mother had forced me to wear black stockings and calfskin boots with pearl buttons when I would have much preferred to be barefoot. I laughed to think of what Monsieur Petit’s reaction might be were he faced by an unruly girl who’d slipped out of her dress. When I laughed at my imagined state, he glanced at me, confused, then studied the dark garden, as if there was something to see in the hedges. The scent of jasmine and frangipani was dizzying, but I was used to it and kept my head. I grew braver and turned my attention to Monsieur Petit, searching his face for clues to his disposition, pleased when he looked up, then quickly looked away. My direct gaze had made him nervous. I took that to mean he would not bully me or tell me what to think. He turned to his glass of sherry as if it was the most compelling thing on earth. That was when I thought I might have the upper hand in the situation. Monsieur Petit politely asked about my interests. Another man wouldn’t have cared. “I believe you’re my interest now,” I told him. It was then I realized this was as much a business affair for Monsieur Petit as it was for me. In that instant I understood he still loved his wife. “The children are very well behaved,” Monsieur Petit assured me. He seemed amused, and perhaps would have enjoyed further conversation, but I stood and shook his hand and told him good night. I did not wish for him to consider our meeting anything more than it was. He had a nice handshake. He did not try to overpower me, as some men might have, nor did he shrink from me. Most important, he didn’t press me to account for my reasoning. In truth, I wasn’t worried that something was wrong with the children. Rather I feared that I might not be able to experience the emotion a mother should possess, due to my own fraught relationship with my mother. I knew from fairy tales about the evil deeds stepmothers might do, how black their hearts might turn. I had no idea what reaction I might have to another woman’s children, especially the daughter who had caused her death. When the Petits’ maid spoke with Adelle, she had divulged that even on her mistress’s deathbed the ailing woman could think only of her newborn daughter. Madame was desperate to live long enough for the naming ceremony, eight days after the birth. If a baby died without a name, the spirit of Lilith, she who preceded Eve, could come for that child’s spirit and claim it as her own. Madame Petit chose the name Hannah, which meant grace. On the day after the naming, Madame was too weak to take a sip of water. She lasted four more days, but on the twelfth day she began to succumb to childbed illness. “If you don’t watch over her, I’ll haunt you,” she had whispered to her maid, frightening the woman so deeply she rarely let go of the child even now, all these months later. She held the baby close all night, watching over her until morning, afraid not of Lilith but of Madame Petit’s ghost. The one thing that could make me walk away from this marriage bargain was if I felt nothing upon seeing the boys and the baby girl. To take care of a ghost’s children, one could not feign love. ON THE DAY I went to the Petit house, I wore what I would have to wander through the hills with Jestine. We favored plain cotton skirts that made it easy to run, in case we came upon some of the wild donkeys with nasty dispositions that might give chase, braying as they nipped at our legs. Jestine came in while I was dressing. “If you join that family you will know only tragedy,” she told me. She had seen the boys in the market, and they looked ragged, like little criminals, even though their housemaid treated them with special kindness. My cousin could be selfish and stubborn, but with Jestine he was tender, a different person completely. I believe he had fallen in love with her on those nights when we were the only people in the world. She returned his love, even though she knew no one of our faith could marry a woman of African heritage. Jestine, although free, would never be recognized as one of our people. Still, Aaron was sullen if she went out with anyone else, whether it be with her mother or her cousins or, lately, even me. When men looked at her, as they always did, he was outraged. He’d gained a reputation as a hothead, someone to avoid. But while Jestine had sleepless nights, Aaron slept quite well. I knew this because when I knocked on his door to tell him his breakfast was waiting, he didn’t even bother to reply. I went in anyway and sat on the edge of the bed. “Do you love Jestine?” I had asked one day. He was a handsome man, yet still a child in many ways. Aaron had pushed me off the bed. “There are rules,” he told me. I was shocked to hear him say so. I thought of us as rebels, wandering the island, going where we pleased, even if it was something my mother had forbidden. “You’re the one who will ruin your life if you don’t understand there are differences among us,” he told me. After that I didn’t trust Aaron. I told Jestine a thousand times, Don’t choose him, but she said in love there were no choices and swore one day I’d find that to be true. I could not concentrate on my books or on the stories I wrote anymore. I listened to the moth that always tried to get into my room, and I wished I could fly with it across the ocean. Perhaps in the cold my heart would freeze and I would care nothing for those I was forced to abandon. “If you’re this bossy with him, he’ll likely cancel the wedding,” my father warned. My father laughed, but he did as I asked. Standing there, I noticed egrets worked into the design of the iron fence. I wondered if Madame Petit had asked the ironworker for this pattern after watching the very birds I now spied in the pond. I didn’t go forward until my father and Monsieur Petit came out. They were so much older I felt silly being young and inexperienced, but then I saw how tentative Monsieur Petit was and I felt my strength. I nodded a greeting, then asked if they would leave. I assured him that women spoke to children in ways men did not understand, or so Adelle had always told me. I said I was comfortable on my own and he could return in one hour. That was time enough. In one hour I would discover all I needed to know. Isaac Petit looked startled. I think he was still in a dream, imagining that his wife might return to him. I saw that his posture was somewhat stooped, as if he carried sorrow on his back. All of this might have made another girl turn and run, but I had always been the sort of person to do my best no matter the situation. I went to the porch, where there was wicker furniture set out facing a long view of the harbor. The water was pale green in the shallows, turquoise in the deep. The sea changed color depending on the tides and the wind. I pried open the heavy mahogany door and slipped inside the house, where it was cooler, darkened against the summer heat with closed shutters and drawn curtains. Being inside was like drinking a glass of chilled water. I stood in the hallway and shivered, thankful to be cold. The boys were clearly expecting a guest, for they found me in the hall fast enough. They had dressed formally for the occasion in white shirts and black trousers, their hair combed back with lavender water. They raced in and looked disappointed when they spied me lingering there. “We thought our new mother was coming,” they burst out. I could tell they thought I was a day woman, hired to help with the laundry. My clothes were plain and I was young. Not what they had expected. “You can have but one mother in this world and no one can take her place,” I assured them. When I asked for a tour, they showed me all the rooms they planned to show their new stepmother. I laughed and chased them down the hall. I let them think I was the laundress; it was the best way to observe their true natures. The older boy, David, was outgoing and talkative. Samuel was the quieter one, who had green eyes, the color of the sea. There was a sadness sifting through him. He seemed older than his age, which was less than four, but I was soon reminded of how young he was. Sometime during the tour of the house, he took my hand, quite naturally. The truth was I liked the feel of his hand in mine, the heat and weight of it. After that Samuel seemed calmer. I thanked the boys for showing off the house. “It’s one of the prettiest on the island,” I said. “Our mother made it that way,” Samuel told me. When he let go of my hand, I felt empty. They went off to play, and I continued along the corridor so I might glance into Monsieur Petit’s room. It was very neat and clean, with a huge mahogany bed. There was white mosquito netting hanging down, held in place through a hook in the wooden rafters. The duvet was a pale mint green of very soft cotton. It seemed Monsieur Petit and his wife had slept together, for she hadn’t her own bedroom, as many married women did, only the nursery next door. I peered inside. The room was dark, and I wondered if I would see Madame Petit’s ghost if I reached out to her, for I knew I could call spirits to me so that they flickered over my palms. Because of this, I kept my hands closed. I suppose I was nervous about what she might say to me. What if she warned me away? What if she uttered a jealous curse? I found my way downstairs easily enough. I wanted to see what else I would discover in this house that had held so much sorrow, perhaps a sign that would tell me whether I should stay or go. In the parlor there was a small piano, painted white. I ran my hands over the keys without making a sound. Then I listened to a bee, tapping against the window, struggling to get inside. I could spy the sea from this room, as green as Samuel’s eyes. Perhaps that was all the sign I needed. The maid was in the kitchen, the baby in her arms as she cooked a soup for lunch. I could smell curry and chicken gravy. The maid had set out johnnycakes on a platter and was drinking a cup of steaming balsam bush tea. Hot food in hot weather, local people say. Such meals heat you up inside and then when you finish and put them aside, you feel cooler. I recognized the maid from the market—an African woman named Rosalie, who had always lived with the Petit family. Her accent was the same as ours, a rich Creole French. When she turned from the stove to see me standing there, she took a step away. The baby in her arms had golden hair and dark blue eyes, nearly violet in color. She waved her small hands at me. Perhaps this was another sign. “May I hold her?” I asked. The maid grasped onto her. “Maybe you’re a spirit,” she said, uneasy. I understood that if a person made a pledge to a ghost, she would fear being haunted if she failed to keep her word. I would have to win them both over, the maid and the spirit of the mistress of this house. I gazed at the stove. There was a heavy cast-iron pot, and the fragrance of the food was unmistakable. Rosalie shrugged, so I took a taste. “Fine,” I said. At that time I didn’t care about love. I didn’t even believe in it, since it had never affected me. Rosalie saw that I was studying Hannah. She was darling, so pretty she looked like a bluebell in a garden. Rosalie threw me a look. She knew what I meant. If I came to live here, I would keep her on. I would share the baby with her. She decided to let me hold Hannah. As soon as the child was in my arms, she gazed into my eyes as if we somehow knew each other. MY HOUR IN THE Petit house passed quickly. The sea had turned a darker green, and pelicans wheeled across the sky. When I left, only Monsieur Petit was waiting at the gate. He looked appealing from a distance, and I noticed that his suit was more elegant than most, presumably tailored in France. There I was in my cotton skirt and blouse, my hair unbraided. I felt like a child beside him as we met and shook hands. Parrots in the treetops called when we went up the hill. It was another good sign to see parrots nearby. The Danish government had sent over mongooses to kill the many rats that made their home around the wharves, but since rats were nocturnal, the mongooses had turned on other prey, attacking our parrots. Now there were fewer than a hundred left in the wild, mostly in the mountains, where the foliage was deep enough for them to hide from these predators. As we walked on, I realized that I no longer considered this to be purely a business arrangement. I felt dizzy, and there was a lump in my throat. I had fallen in love, not with Monsieur Petit but with the children. We were silent as we strolled through town, unpracticed in the art of conversation with one another. When we reached my parents’ house, Isaac Petit gently placed his hand on my arm. I didn’t shrink from his touch as I’d imagined I would. Monsieur Petit nodded. I saw his grief pass over his face. “You will do well all the same,” he told me. He was an agreeable man, more attractive than I had first thought. No wonder my predecessor had fallen in love with him, and slept in his bed rather than have a room of her own. Throughout my life my mother hushed me whenever I tried to speak my mind, but if I kept silent now, I would never be able to be honest with this man, so I decided to say what another woman might keep to herself. “When you think of the woman who is your wife, I will not expect you to think of me first,” I told Monsieur Petit. He kissed me on both cheeks, as a father might have. Jestine would have been disappointed. She would have wanted him to kiss me on the mouth, and place his hands on my waist and draw me near. But I was pleased and relieved. I was so young I believed that, when it came to a marriage, there could be matters more essential than love. “So we have an agreement?” I said. But such a thing did not exist in our world, not unless it came to making a marriage that would benefit all concerned. From the New York Times bestselling author of The Dovekeepers and The Museum of Extraordinary Things comes a spellbinding tale of forbidden love, family secrets, and unimaginable beauty. Set in St. Thomas in the early 1800s, The Marriage of Opposites follows one of history’s lesser known women: headstrong and rebellious Rachel Pizzarro—the mother of one of Impressionism’s founding artists, Camille Pissarro. 1. Discuss the title. Which marriage or relationship does “The Marriage of Opposites” refer to? Where in the novel do you first recognize the title’s significance? 2. In Chapter 1, Rachel says, “Perhaps that was what my mother disliked most. I resembled her. I could not help but wonder if for some women, that was the worst sin of all.” Discuss Rachel’s relationship with her mother, her own stepchildren, and female relationships around her. What sort of resemblance does she mean? Compare these relationships with the one Rachel has with her son, Camille. 3. “. . . on this island, strength was a necessity” (page 22). Consider the power dynamics in the novel, from mental strength to willpower, physical strength versus financial dominance. Discuss what is meant when Rachel’s father tells her that her marriage is “a combining of strengths” (page 27). For these characters, which strength is most valuable? 4. Discuss the importance of identity in the novel. What are the roles of religion, race, and class as they contribute to each character’s definition of self? 5. Weather and the natural world figure strongly in The Marriage of Opposites. Consider how Rachel, Frédéric, and Camille view the rain and the heat. Discuss the differences or similarities in their points of view. How do descriptions of weather define life on St. Thomas and life in Paris? 6. There are many sorts of love that are “forbidden” in the novel. Why does the community disapprove of Rachel and Frédéric’s relationship? Why does Rachel later disapprove of her son’s relationship with a working member of her household, when she herself has been so close to Adelle and Jestine? 7. The mystical world plays a key part in life on the island. Often, characters speak of spells, spirits, and ghosts and use herbs to cure emotional and physical distress. Compare the role of spirituality on St. Thomas and in Paris. At what point does the mystical distinguish itself from Jewish tradition? 8. The relationship Madame Halevy forms with Camille? Why do you think he is so interested in her and the stories she has to tell? 9. Discuss this line from page 272: “But a servant, no matter how beloved, was not a friend, and a slave was a shadow, nothing more.” What did you learn about slavery and servant culture in St. Thomas in this novel? Do you feel it is similar to American slave-owner, servant-worker relationships? Can there be true friendships in a relationship where one person has more power than the other? 10. “Always pay heed to the woman who comes before you. If he’s treated her badly, he will treat you much the same” (page 231). How does Rachel’s understanding of Madame Petit affect the way she raises her children? Does this statement grant Lydia any sense of clarity on her father? Discuss how Rachel, Lydia, and other women understand the roles of the women who came before them. 11. The Marriage of Opposites contains a fluid definition of family. Many characters, both male and female, have illegitimate children who are unacknowledged, abandoned, or cast off. Discuss the different manifestations of family in this novel. Were you surprised to learn who Aaron and Jestine really are? Why or why not? 12. In the afterword, Alice Hoffman explains briefly how she came across the story of Pissarro’s mother. How was your reading of the novel or opinion of it affected by the knowledge that this is based on a true story? 1. “Like the breakfast he’d had, the landscape was a familiar part of him that surfaced in his dreams and in his art” (page 257). With your book club, research Camille Pissarro’s artwork on the Internet or, if you are able, visit a local museum that features his work. Discuss how the novel’s setting is manifested in his work. Is The Marriage of Opposites characteristic of Pissarro’s style? Are there paintings that remind you of scenes in the novel? 2. Select one of Alice Hoffman’s other works, such as The Museum of Extraordinary Things or The Dovekeepers, for your next book club meeting. How are these works similar or dissimilar to The Marriage of Opposites. 3. Research the colonization of St. Thomas—especially the history of the Jews there—and native spiritual culture. Does anything in your research surprise you? 4. For your next book group, select a book about other “invisible” women in history. Try to discover the stories of women in your own family. Interview older relatives or read about history of women in your own culture. 5. To learn more about Alice Hoffman, visit her website at www.alicehoffman.com or connect with her on Facebook at www.facebook.com/alicehoffmanauthor. I was at an exhibit of Pissarro’s work at the art museum at Williams College. It was there I first realized he was a Jew and had been born in St. Thomas. I’d always assumed he was French, as he was one of the fathers of Impressionism. I then wanted to discover what else I didn't know. When I began reading about the scandal his mother’s marriage had caused I knew I had found my story. Your female protagonists are always formidable. How did you find and develop Rachel’s voice? The title of the novel The Marriage of Opposites could apply to almost any marriage—or relationship, for that matter—in the work. How did you select that title? “The Marriage of Opposites” is an alchemical term—to create any substance or circumstance one has to combine opposite materials, in love and in all things. This term seemed so right for the marriage of Camille Pissarro’s parents, but also for many other relationships in the novel, and then in a broader historical sense—that people from all over the world are thrown together on this island and that they create a marriage of their cultures. I usually read everything I can, then begin to write, then research again. It’s a process of layering fact and fiction. I want all the historical references to be correct, but I am also creating characters, both the ones based on historical characters and the ones who are completely imagined. You’ve penned several dozen novels for both children and adults, as well as a memoir. Do you have a preference for a particular age group? Does a specific theme seem to weave its way into works for one age versus another? What do you see as the difference between writing in each genre? I love writing for children and teens, mostly because I always feel that is such an important time in a reader's life. What you read at that point forms who you are as a reader. Each book comes to me as an adult novel or a children’s novel or a teen book or nonfiction. Some work comes to me as stories, other as novels. My themes are always the same: Love, loss, and survivorship. But the way I write about these themes differs, depending on the book. Of your writing, do you have a favorite work? Is there one character whose story you’d like to return to? I often miss characters when a book is written. I have missed Rachel Pizzarro greatly. I often think she is the sort of woman I wish I could be. I’ve thought it might be interesting to know more about the world of Practical Magic. And I’ve just written a children’s book called Nightbird, and I very much miss the town of Sidwell, Massachusetts, that I imagined. For me, the Jewish themes very much related to my grandmothers and to their stories and to their struggles. It’s part of telling the story that hasn’t been told. I’ve enjoyed learning more about my own history and culture. To further the above question, your publisher said that you consider The Marriage of Opposites the “story of the ultimate Jewish mother.” Both Rachel and Madame Pomié are intense mothers. Are they modeled after anyone in your own life? Rachel Pizzarro has something of a bad reputation, as being bossy and controlling, which is the stereotype of the “Jewish mother.” I wanted to explore this and understand what it is to be a mother in a dangerous world where you are an outsider and your ultimate goal is to protect your children no matter the cost. Again, my grandmothers were the model for women who would do anything for their children. I have to say, I don’t have a desk. I write wherever I am, whenever I can. Noise doesn’t bother me, and I prefer not to have a window, which would distract me. I write the way I read—on a couch, in a bed, on a train. In a 2013 interview with Writer magazine, you said, “The idea of magic and reality intertwined is really appealing to me. I lived in a working-class suburb in Long Island, right over the border from Queens, so it was very gritty. Every house was the same. There were no trees. It was neither here nor there. It was the least magical place. And yet it felt magical. If you can view that place with magic, any place can be filled with magic.” Are there any magical stories, histories, or eras that you haven’t yet explored in a novel that you’re interested in researching one day? For me, magic is a part of every story. It is the original story—myth and fairy tale— and I can’t imagine writing without some element of magic being a part of my work. We’ve read that some your favorite authors include Emily Brontë, Toni Morrison, and Ursula Le Guin, among many others. Of your favorite books, is there one in particular you wish you’d written? Is there one particular book you return to often? I love those authors. Toni Morrison is the greatest living author and I admire her more than any other writer. I am an Emily Brontë fanatic—for me, Wuthering Heights is the greatest psychological novel ever written. And as a fan of fantasy and science fiction, I have to say Le Guin transcends all genre writing—her worlds are astounding. I also often go back to childhood authors that meant so much to me, especially Ray Bradbury, who taught me so much about what it means to be a writer, and what it means to be human. My next novel is something completely different—modern, edgy, set in New York, with a character named Shelby who is desperately trying to find her place in the world.